Turkey has agreed to let the so-called “U.S.-led anti-ISIS” coalition to openly use Turkish airbases at Incirlik, Diyarbakir, Batman and Malatya for coalition aircraft conducting sorties against ISIS. At the same time, Turkey began launching airstrikes targeting members of the PKK Iraqi Kurds in northern Iraq. Clearly, the Turkish agenda is not focused on combating ISIS. If it was, the Turks would have long ago sealed their borders with Syria, then ceased buying ISIS oil and training and facilitation of terrorist groups flowing into Syria from Turkish territory. 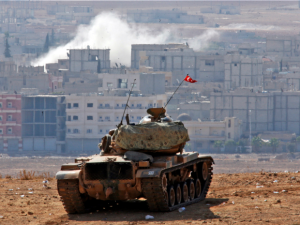 Turkey’s decision to help the “anti-ISIS coalition” is clearly motivated by its own strategic interests. One of them is limiting the expansion of armed Kurdish groups along the Turkish border. The zone will extend forty to fifty kilometers into ISIS-held regions of Aleppo Province in northern Syria. Turkish sources referred to the region as a no-fly zone and claimed that Syrian Air Forces aircraft entering the zone would also be targeted. The U.S. officials including U.S. Special Envoy to the Anti-ISIS Coalition Gen. John Allen publically denied that the implementation of a no-fly zone had been “part of the discussion.” However, a real practice in the application of the ‘buffer zone” agenda will indicate opening a new staging ground allowing terrorists such as ISIS to conduct attacks deeper inside Syria. Thus, it will open for the US, Turkey and their moderate rebel allies new opportunities in opposing Bashar al-Assad’s government.